Carisbrook is a rural township on the Pyrenees Highway and the Castlemaine to Maryborough railway line, 8 km east of Maryborough. It also intersects with local roads to Talbot and Eddington, and is on the Tullaroop Creek. Reputedly Carisbrook’s name came from ‘Carrie’s Brook’, named after Caroline Bucknall, the daughter of E.G. Bucknall, an early local pastoralist. However, before the town was surveyed in 1851 there was a police camp and lock up named Camp Carisbrook, implying that the name could have had another origin. There were pre-existing Carisbrooks in New Zealand and the Isle of Wight. Carisbrook was toward the edge of the Maryborough goldfields, but a good water supply underpinned its prosperity. Local land owners Joyce and Simson opened a flour mill in 1856. The first store opened in 1853 and an Anglican church and school began in 1855. 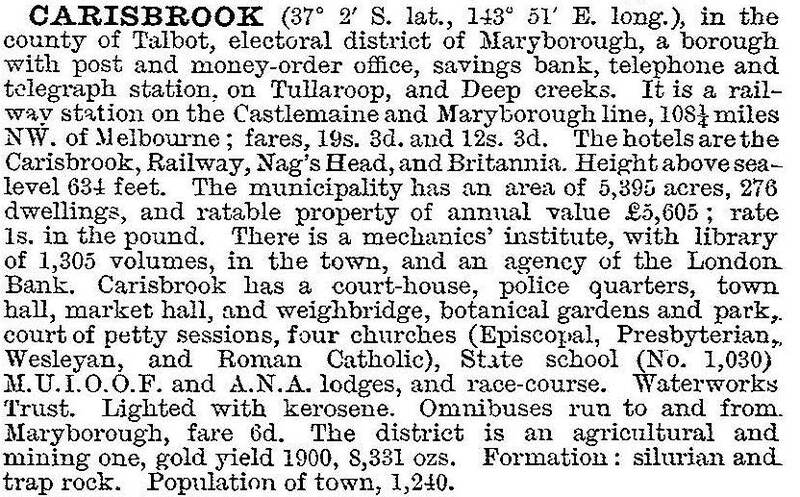 There were bakeries, a brewery, four hotels, brickyards and several stores when Carisbrook was proclaimed a borough on 7 August 1857. In addition to these amenities Bailliere’s Victorian gazetteer recorded a mechanics’ institute, an agricultural society, a cricket club and a racecourse in 1865. Catholic, Methodist and Presbyterian churches followed in a few years, and a railway station was opened when the line was constructed in 1874. On 1 October 1915, when the borough’s population was fewer than 1000, it was united with Tullaroop shire. The area’s agricultural economy kept the town’s population from falling under 300, and civic works such as tree planting and improvement of reserves took place. The Housing Commission opened a mobile homes factory in Carisbrook in 1950. In 1982 a leisure centre was opened, providing a venue for several indoor sports. Carisbrook has a harness racing track, sports oval and reserve, tennis courts, bowling greens, a hotel, a motel, Anglican, Catholic, Presbyterian and Uniting churches, a weekly newspaper and a school (269 pupils, 2014). The railway station and goods shed are no longer used. A log police lock up (c1852) is on the Register of the National Estate. Junction Lodge (c1873), a pastoral homestead, and an Aboriginal stone arrangement near the Tullaroop Creek are also on the Register. Matilda (Tilly) Aston (1873-1947), blind writer and teacher, was born in Carisbrook, living there until 1882 when she enrolled as a boarder at the Melbourne School for the Blind. There is a cairn in Carisbrook commemorating Tilly Aston. In September 2010 and again in January 2011 many parts of regional Victoria experienced widespread severe flooding. In Carisbrook the town was completely inundated from floodwater in Deep Creek with 800 people evacuated and many homes damaged. More than 190 houses, two churches and a club were inundated. An emergency relief centre was established at Princes Park in Maryborough after the emergency centre in Carisbrook was inundated by floodwaters. Damage was sustained to Caroline’s Colonial Restaurant, the building established in 1853 as the town’s first grocery store. It had been damaged by fire in 1937 and rebuilt from its original bluestone.